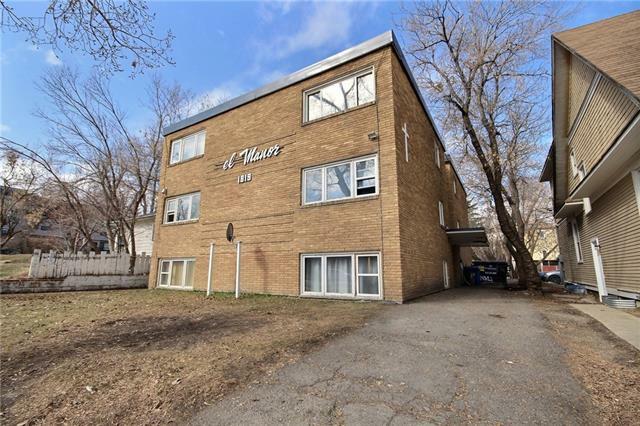 "For more info click Multimedia - LUCRATIVE POSSIBILITIES as zoned for up to 19 Condo Units in the area of Bankview in Calgary! Bel Manor is a solid low rise 12 Unit Apartment Building. This quiet property is in close proximity to many amenities and only a few blocks from the entertainment of 17th Ave. LOW VACANCY RATE, turnover to a minimum. The building is comprised of 11 one bedroom units and 1 bachelor unit. Built in 1963, many units have been partial renovated as required when tenants move. All include Fridge and Stove. Very Good SAFE investment as units currently rented with dependable Income. LOW MAINTENANCE Parking, 6 Assigned Stalls Back of Building and paid Laundry on-site. Upgrades: New laminate flooring & windows in almost every suites and new appliances for most suites. Roof redone in 2009. - For more info click Multimedia"